I have an older AirPort Express Base Station. 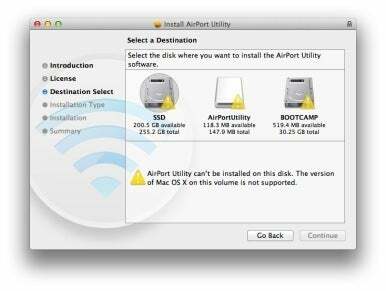 I recently installed Mountain Lion and have found that its version of AirPort Utility doesn’t work with this Base Station—when I try to select the base station I’m told that I need AirPort Utility 5.6. I downloaded that version but when I attempt to install it Mountain Lion tells me it’s not supported. What do I do? Mountain Lion is telling you an untruth. That version of AirPort Utility will run on your Mac (even under Mountain Lion) and work with your Base Station. The fly in the ointment in this case is the installer. It simply refuses to install this perfectly fine utility. Doesn't work with Mountain Lion? Nonsense. The way around is to extract the utility from the installer package. For this kind of thing I always turn to CharlesSoft’s $20 Pacifist. Pacifist lives to open .pkg package files, .dmg disk images, and .zip, .tar, .tar.gz, .tar.bz2, and .xar archives and extract their contents. I ran this very package through Pacifist, located the application, extracted it, and it ran like a champ on my MacBook Pro—allowing me to configure an ancient AirPort Express Base Station.